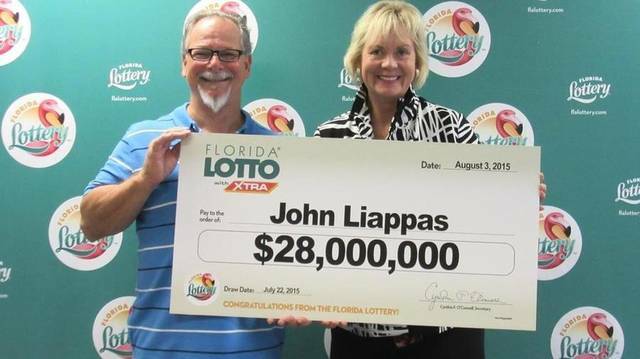 The email message below, which claims that John Liappas, the 63-year-old man who won Florida Lotto's $28 million jackpot in 2015, is donating thousands of dollars to randomly selected people around the world, is a lottery scam. The lottery winner is not randomly donating money to people around the world and did not sent the email message below. The fake email message was instead sent by scammers. The scammers/cyber-criminals are who are sending out the fake email messages, and who are pretending to be John Liappas, are attempting to trick the recipients into sending them their personal information. Recipients of the John Liappas lottery email scam are asked not to respond to or follow the instructions in it. They should just delete the email message instead. I am most grateful for your email and I use this as a medium to say thank you for writing Back. This is a lifetime opportunity and 100% legitimate. My names are John Liappas, i decided to make sure that my winning is put on the internet for the world to see. This was a gift from God to me and my entire family. I may not know you, but since you were chosen by God to receive this cash donation of $ 500,000.00 , you must be a God fearing individual. I do believe that good things happen to those who wait upon the lord. At first when i saw the winning numbers, I did not believe, thinking it was just a mere joke until the cheque of ($28 Million dollars) was given to me willingly as won. The main reason why i decided to share part of this fund among other individuals who are in need is according to the bible that teaches about given as part of Godliness and also with the prophecy we received from God Almighty. I have taken care needs of my immediate family members & friends, Hospitals & Charity Organizations in Africa, Asia and Europe that fight cancer, Alzheimer's and diabetes. May the good Lord bless your heart to be a blessing to your family & friends. Congratulations once again.